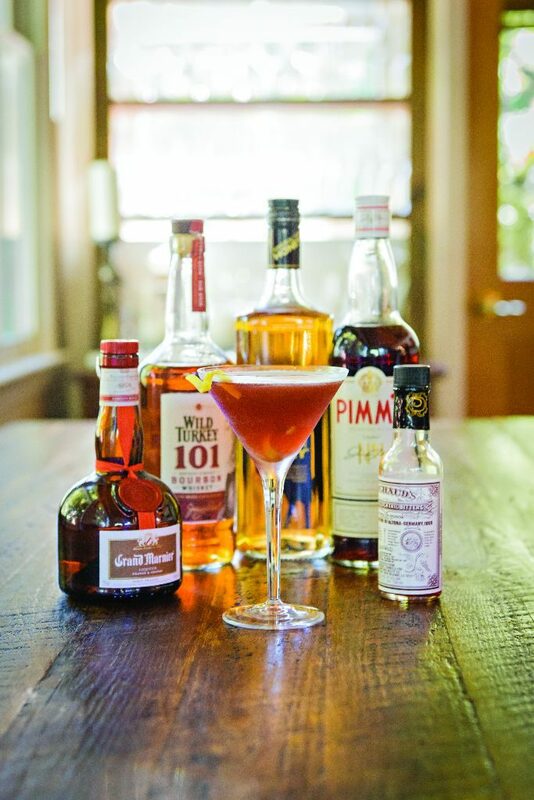 “The Gobbler,” created by John MacPherson, the former chef and co-owner behind Sperryville’s esteemed Foster Harris House, is a seasonal variation on a tried-and-true cocktail: the Manhattan. This is a highly flavorful drink that features a complex blending of flavors. The grated ginger adds a zesty spiciness. The tart cherry juice and Pimm’s add a natural fruitiness balanced by the citrus tones of the Grand Marnier. Finally, there’s the wallop of Wild Turkey. There are plenty of recipes for turkey lovers and tryptophan fans, so here’s one for the curious imbiber! Combine all ingredients over ice in a Boston cocktail shaker. Shake vigorously for 30 seconds until shaker is very cold. Strain into a chilled cocktail glass. Garnish with a twist of lemon.